While my daughter and I were texting back and forth this morning, I was reminded of a saying that I have quoted many times and that I truly believe. “Friends multiply our joys and divide our sorrows.” My daughter had texted that this past weekend had been “weird”. Her husband and her had celebrated a friend’s baby being born and had also found out that a couple in their group of friends was divorcing. I had texted her “Multiplying joys and dividing sorrows – this is what life is. Sorry to hear about the divorce…” Anyway I got to thinking where did I first hear that expression – “multiplying joys and dividing sorrows”. So I googled it and came across this poem which I hadn’t read before but wanted to share with you. I hope you have a friend or two that fills this description. I am very blessed to have friends that are radical, fanatical and mathematical. And bear with you when you’re unbearable. than the sum of all their parts. 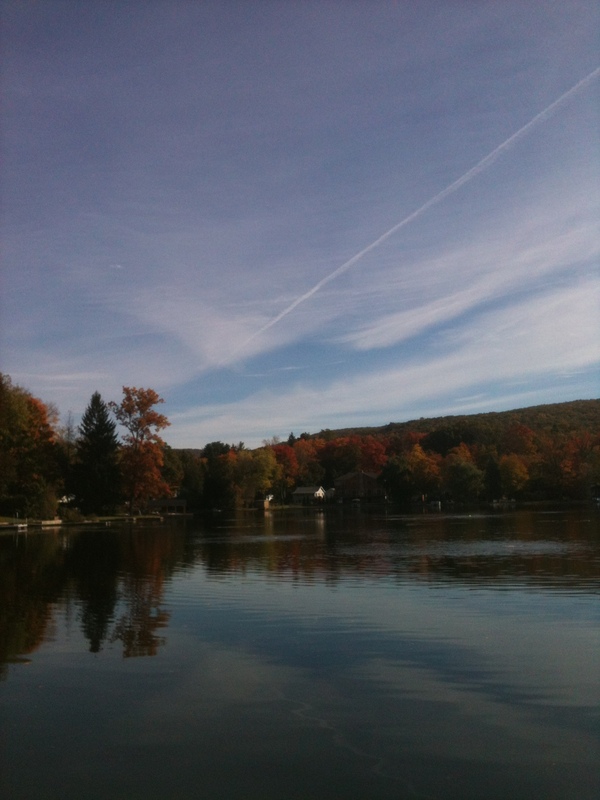 Both yesterday and today the sky has been a wonderful color of blue and there are streaks of white clouds. Blue skies with no clouds no matter how beautiful make me nervous. Definitely goes back to September 11, 2001. But I digress. There is a crispness to the air that is refreshing. A light coat or jacket is needed but probably won’t be later in the day. The leaves are changing colors. Many different shades of orange, yellow and red add splendor to the usually green mountain side. The water of the lake acts as a mirror reflecting the changing landscape. Yes, it is a beautiful day in my neighborhood. “A beautiful day in the neighborhood” always makes me think of Mr Rogers. My firstborn loved Mr Rogers. To be honest he made me crazy. The walking in and changing his shoes, putting the sweater on, the puppets just made me nuts. But E. loved it. Once when we were out and deciding which fast food restaurant to go to, E. said “can we go to Mr Rogers?”. She thought Roy Rogers was Mr Rogers. Whenever I think of Roy Rogers, I am reminded of a childhood memory of seeing the real Roy Rogers at the rodeo in Utah. I remember seating in the stands. I was in kindergarten. And Dale Evans and her children rode past in a convertible. They were waving to everyone. And Roy Rogers rode in on Trigger. It was the first time I had ever seen someone in real life who had been on television. That is all I remember but it was a very exciting moment. I have grown to appreciate Fred Roger’s dedication to quality children’s programming and his words of wisdom. I think when my daughter was young he annoyed me so much because he was so calm and I on the other hand was a crazed want to be super mom. I have included some of his words of wisdom to ponder. Enjoy! Parents are like shuttles on a loom. They join the threads of the past with threads of the future and leave their own bright patterns as they go. Fred Rogers (20th century), U.S. television personality and parenting specialist. Mister Rogers Talks With Parents, ch. 1 (1983). Very early in our children’s lives we will be forced to realize that the “perfect” untroubled life we’d like for them is just a fantasy. In daily living, tears and fights and doing things we don’t want to do are all part of our human ways of developing into adults. Fred Rogers (20th century), U.S. television personality and parenting specialist. Mister Rogers Talks With Parents, ch. 11 (1983). I like to compare the holiday season with the way a child listens to a favorite story. The pleasure is in the familiar way the story begins, the anticipation of familiar turns it takes, the familiar moments of suspense, and the familiar climax and ending. Fred Rogers (20th century), U.S. children’s TV personality and author. Mister Rogers Talks with Parents, ch. 11 (1983). That is part of the note I received today. After I shed a few tears and thanked God for His amazing ways, I went and pulled out the first note I received from “Nita” in Oklahoma. It was a simple card with a watercolor type drawing on the front of a table and two chairs and printed on the inside it stated “thinking of you”. There was also a mauve piece of writing paper with a hand – written note dated November 20, 2001. The note would go on to say that Nita would “like to do something special for me for the Christmas season, if that would be ok.” Nita would also ask if I had children so she could remember them also. I would respond to Nita’s note and she would send a beautiful homemade Christmas tree and home-made ornaments. 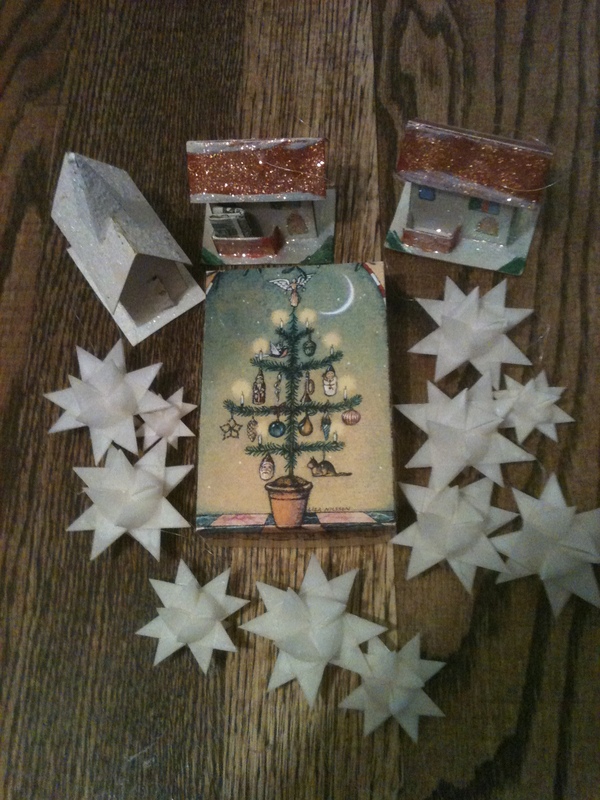 The ornaments would include two small houses with a twenty-dollar bill tucked in each one. One for each of my daughters. My younger daughter’s twenty dollars in still in the little house. My older one spent her’s. 🙂 Each year as I display those items I am awed by the kindness of a stranger. But what made the note extraordinary was the way it was signed – A concerned Grama in Oklahoma, Nita W. In further correspondences with Nita, she would tell me that she just knew she was supposed to sign her note that way. She didn’t understand why but she just did it. She would understand why when I told her my grandparents were from Oklahoma. My grandparents had been dead for years but seeing that salutation was a gift. I realized the other day that I had an acorn in the pocket of my jean jacket. 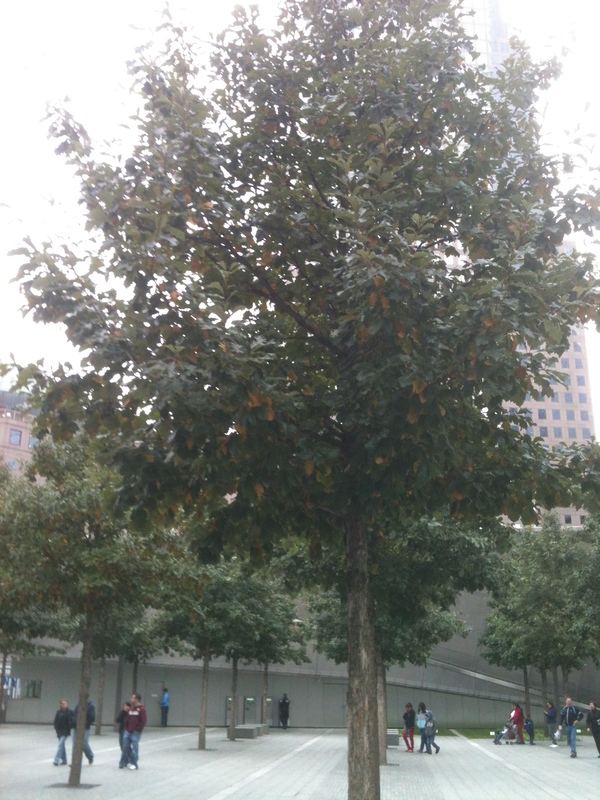 Not just any acorn but an acorn from one of the white swamp oak trees on the National September 11 Memorial. I had placed the acorn in my pocket last fall and forgotten about it. I remember hearing or reading somewhere “think about it which is more of a miracle: an acorn taking years to become a mighty tree or if the acorn instantly became a mighty tree.” I think both are miraculous. We live in a time when instantly seems to be the amount of time it should take to do anything. Don’t get me wrong. I am grateful for the advances in food preparation, communications, and even something as basic as ready-made clothing but I also wonder if we have lost something along the way. I also think we have lost the wonder. Think about it a tiny acorn can become a mighty oak tree – wow!! Do we still have “wow” moments? It is “wow” moment when all that preparation on Thanksgiving produces a delicious meal shared by family and friends. It is a “wow” moment when your good friend hands you a hand-made knitted pumpkin for no other reason than she is sharing her talents and love with you. Those “wow” moments took time and intention. I read that when the cathedrals of England were being built people knew they would never see the completion in their lifetime but they still donated their talents and money. They were in for the journey even though they wouldn’t be there for the completion. There are many opportunities in our present world that need us to be there for the journey. When I started leading tours for the Tribute Center there was only an empty hole where the WTC had been. There wasn’t even the Tribute Center. But now there is there a busy construction site, a Tribute Center and a National September 11 Memorial with trees. Someday there will be a museum but for now I will keep leading tours and every time I stick my hand in my pocket I will think “wow”. On Tuesday, I had the opportunity to tell my September 11 story to a group of teens at the high school my daughters had attended. My plan for the morning had been to leave early, go to the post office and then drive the route I had driven so many times before. Well when Tuesday morning rolled around, I realized I had time to go to the post office later in the day and just felt that if I went first thing I may be late for “school”. So I left and drove the same route I had driven so many times before. I even made note of “what color was winning?”. When my girls were little and we would travel a similar route to their childcare center, I would ask them “what color is winning?” translation which color of leaves is the most prominent. I did make a detour through Starbucks for a Grande Chai Latte. I was glad Starbucks hadn’t been on the route to school when my daughters were in high school or we would have had to leave the house even earlier. Anyway on Tuesday I would arrive at “school” early and I would sit in the car for a few minutes finishing my Chai Latte. I would decide to go into the office to visit the “office moms” as my younger daughter used to call the two wonderful women who manage the front office (and the school). As I walked up to the front door of the school a woman was walking in carrying a gym bag. She held the door open for me and I followed her into the front office. I stood back as she explained to one of the “office moms”, Mrs P. that her daughter had called/texted her to say she had left her gym clothes at home. Mrs P said she would take care of getting the clothes to her daughter. And then Mrs P. looked at me and said “you two have something in common.” Later, Mrs P would tell me that when she looked up from her desk and saw both of us standing there she couldn’t believe it and realized we needed to know we shared a connection. So I told the “gym clothes mom” that my husband was one of the firefighters killed on September 11 and I asked her what her connection was. She told me her husband had been killed on the 101 floor of Tower 1. We both expressed our condolences to each other and then I asked her if I could give her a hug. We hugged and continued talking. I asked how old her children are (15, 17) and we had an amazing conversation. I asked if she would like to have coffee sometime and gave her my “card”, we hugged again and she left. And that was a God moment because there is no way we should have both been in that office at that moment. I am very grateful for His plans for my days.